Fish exposed to increased noise levels consume less food and show more stress-related behaviour, according to new research from the University of Bristol and the University of Exeter. However, the way fish decreased their food intake differed between the two British species tested. 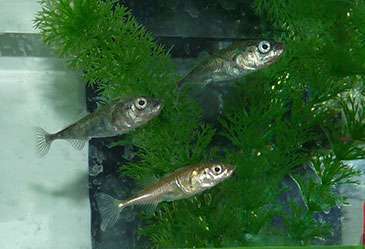 When exposed to noise, three-spined sticklebacks made more foraging errors whereas European minnows tended to socially interact more often with their companion fish or to reduce activity. Lead author Dr Irene Voellmy, from Bristol's School of Biological Sciences, and colleagues used controlled laboratory experiments to investigate how the foraging behaviour of sticklebacks and minnows change in response to playbacks of ship noise. Such noise is one of the most common human-generated sounds in aquatic environments and its potentially detrimental effects are of growing concern. In the real world, decreased overall food intake in response to noise could impair growth rates, survival and breeding success. Fish may invest more time in foraging to compensate which could increase their risk of being eaten by predators and also reduce time available for other activities. Moreover, fish making more foraging errors when exposed to noise may risk poisoning which would further impact on their fitness and survival. Dr Voellmy said: "Since sticklebacks and minnows showed different responses to noise, this study indicates that fish species may be differently affected with potential consequences for population and species community levels." The research is published in Animal Behaviour.